Both offer five-passenger seating and a lot more cargo-carrying versatility compared to traditional family sedans. Both also achieve nearly 30 mpg in combined city and highway driving and start around $25,000. So, which is best for you? 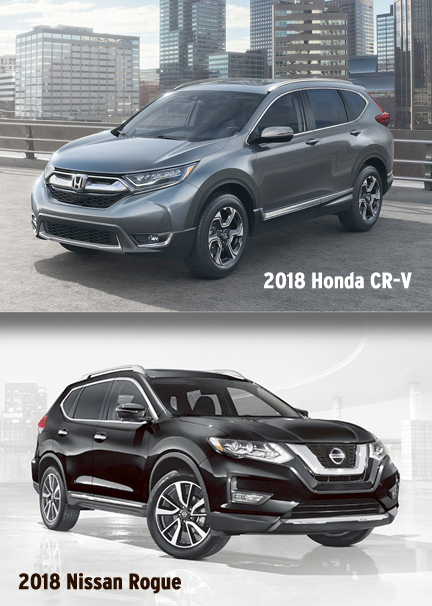 The CR-V and the Rogue are based on carlike platforms. The former is structurally based on the Civic, while the Rogue uses a light-car design that underpins other Nissan models. Similarities continue under the hood with four-cylinder engines, continuously variable automatic transmissions and optional all-wheel drive. Since the basic specs for the Honda and Nissan are so similar, you might be inclined to just find the best deal and call it a day. But look closer and you’ll find key differences that favor the CR-V.
First, today’s CR-V is newer. When Honda last redesigned the CR-V in 2017, it gave it a new turbocharged engine, improved handling, more rear-seat legroom and a modernized interior. The CR-V’s 184-horsepower engine packs a stronger punch than the Rogue’s 170-horsepower engine. The CR-V even offers an optional turbo engine that yields 190 horsepower. The Rogue offers just one engine. The CR-V’s power advantage doesn’t hurt fuel economy either: It delivers an EPA-estimated 28 mpg combined (26 city/32 highway). The Rogue is incrementally better at 29 mpg combined (26 city/33 highway). Both crossovers offer surprisingly upscale interior materials and similar technology features, starting with 7-inch touchscreen displays and Apple CarPlay and Android Auto smartphone integration. But the CR-V beats its rival in safety technology with a full complement of driver aids on its EX model, the trim just above the base level. Those features include collision warning, automatic emergency braking, lane departure alert and lane keeping assist. The Rogue has some of these features as standard, but others are reserved for the top SL trim. Given its larger passenger and cargo space, enhanced technology and better performance and handling, the 2018 Honda CR-V claims an edge on the 2018 Nissan Rogue. You also get more driver safety aids at a lower trim level. The Rogue is Nissan’s top-selling car, so we don’t expect fundamental changes soon. But this is a competitive segment that evolves quickly. We’d expect Nissan to polish some of the Rogue’s rougher edges in the next couple of years, making it a tighter race among these two top rivals. Unless you need the Rogue’s third row, the CR-V is by most measures the better crossover. Dan Frio is an automotive editor at Edmunds.